The “Golden State” // California, accounts for nearly 90% of the American wine production; Merus Winery which is located in Napa Valley, CA accounts for a fraction of this production. 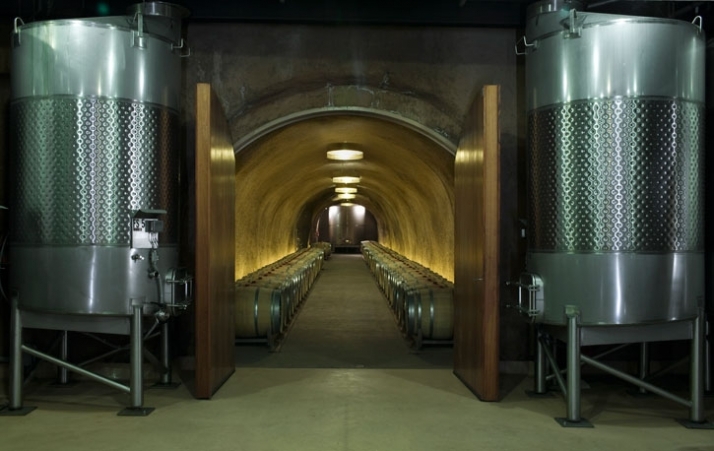 Napa County, once the producer of many different crops, is known today for its exquisite wine industry, it is also a premier travel destination in the world. 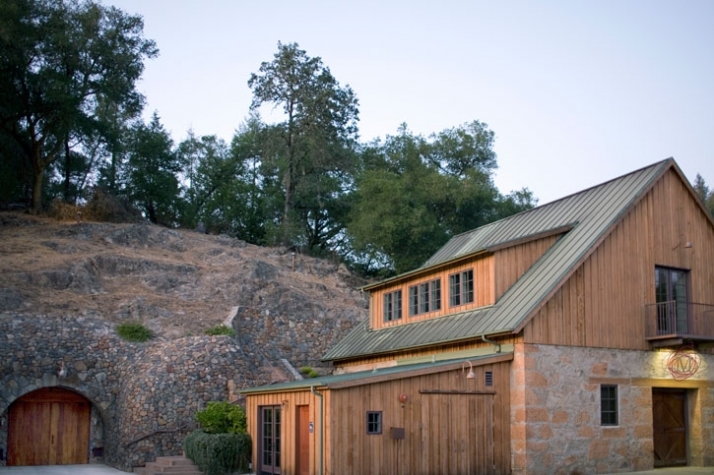 Breathtaking views abound at every turn – mustard in the late winter, picturesque rolling hills planted with vineyards year-round and wineries of every stature dot the landscape. 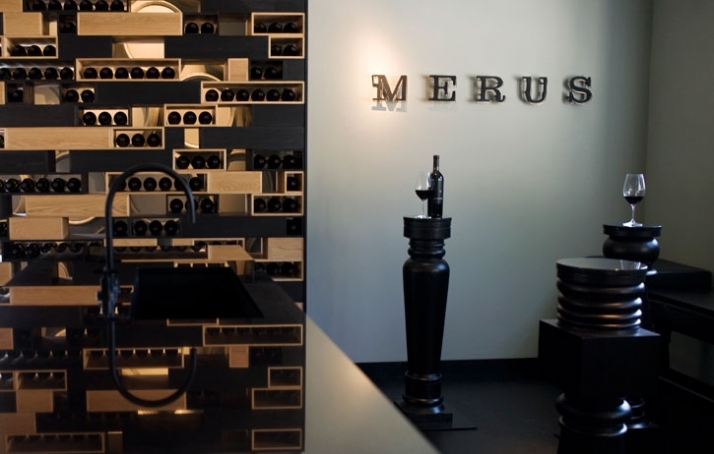 Merus Winery could do no other than to keep these high standards of excellence and transitioned from a premium artisanal cult wine to a true luxury product of the highest level. UXUS Design consultancy firm was commissioned to create a unique experience where the customer would value the excellence and the complexity of the Merus brand. (mer * us) n. [latin] 1. Pure, unmixed. 2. Complete, absolute, undiluted; especially of wine. The winery is based on sophisticated heritage with modern superiority, cultural juxtaposition and unique and individual experience. 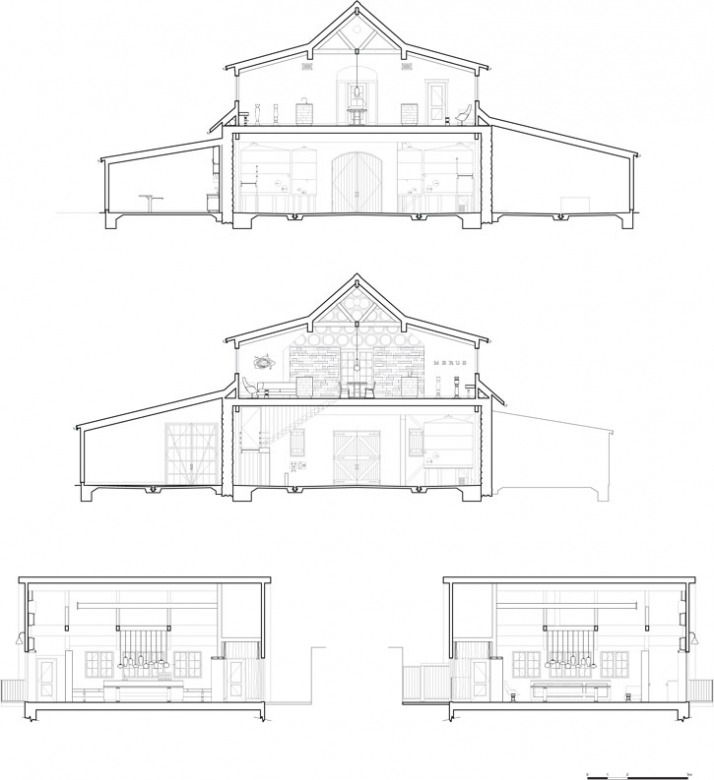 The floor plan of the winery consists of three main rooms; The Tasting Room, Cave Tasting Table and the Cave Events Space. 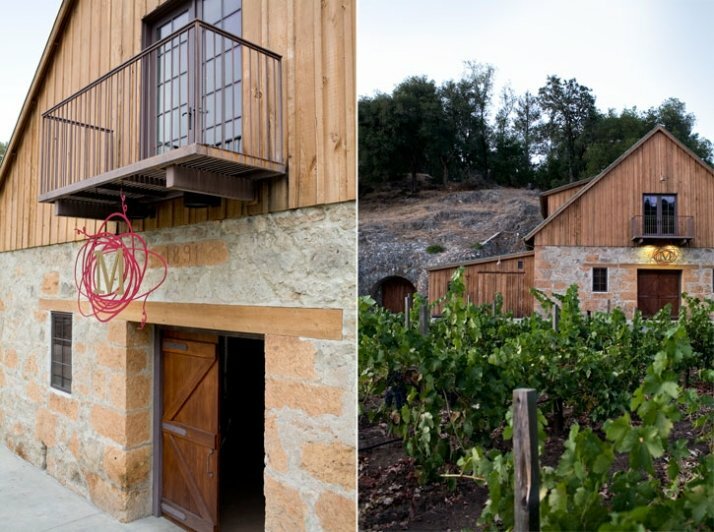 The Tasting Room which is located in the main building of Merus Winery has a combination of elements and styles. 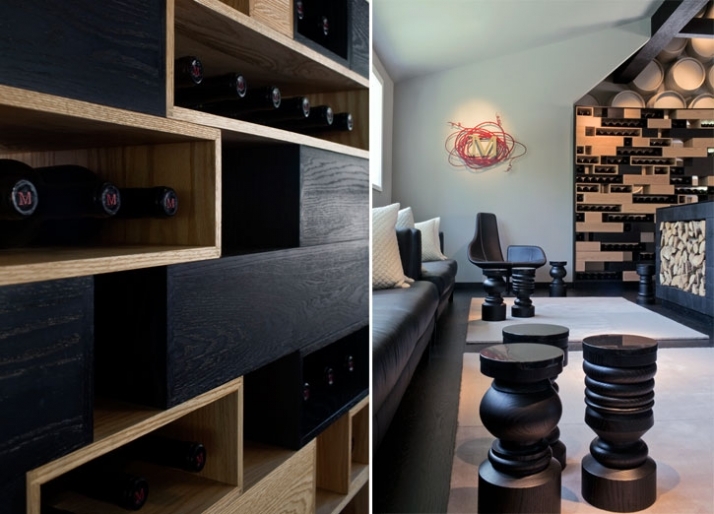 UXUS Design created a chess-like appearance in The Tasting Room where oak wood has been stained in black and also left in natural finish with clear varnish. 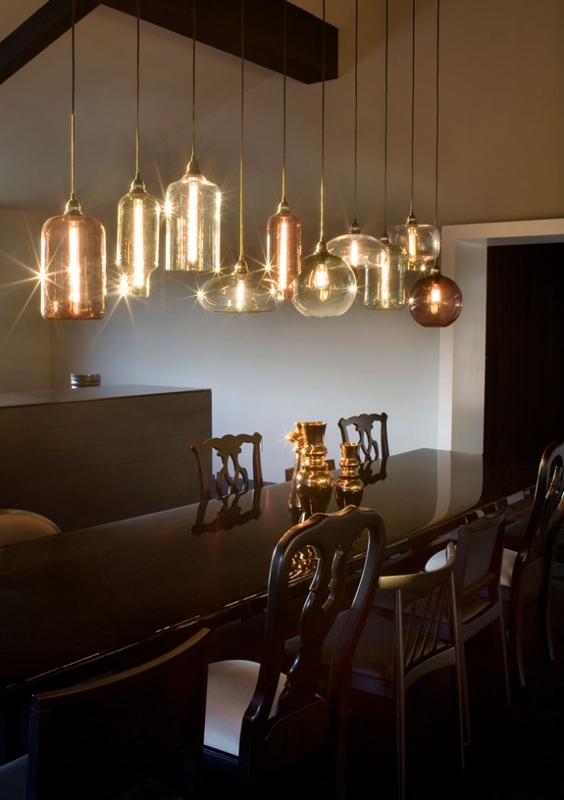 The cottage-like roof, the dark hardwood flooring and the lighting creates a sophisticated yet intriguing environment. 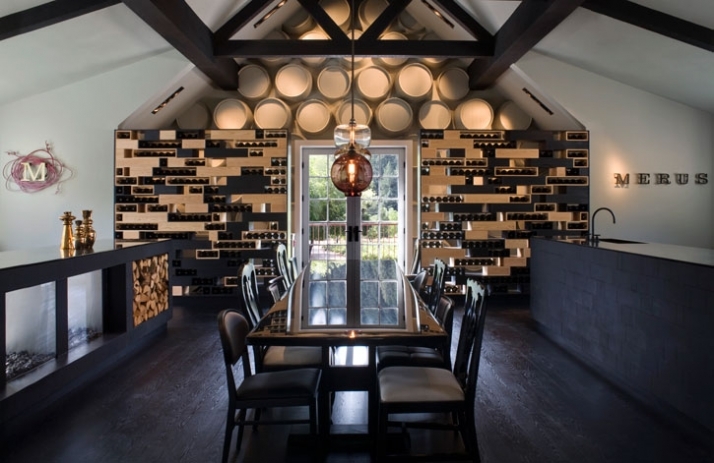 The black stained wooden beams and the tall ceiling create an atmosphere of grandeur and top quality as the brand of the wine. Wine barrels have been cut and re-used to create an interesting sculptural piece of wall art. Materials and furnishings which are used in this room are black granite, lacquered surfaces, custom turned wood pedestal tables, Driade sofas and other cutting edge contemporary furnishings, come together to create an unforgettable atmosphere. The tone of the room is complex and stylish while it exemplifies the same qualities of Merus. 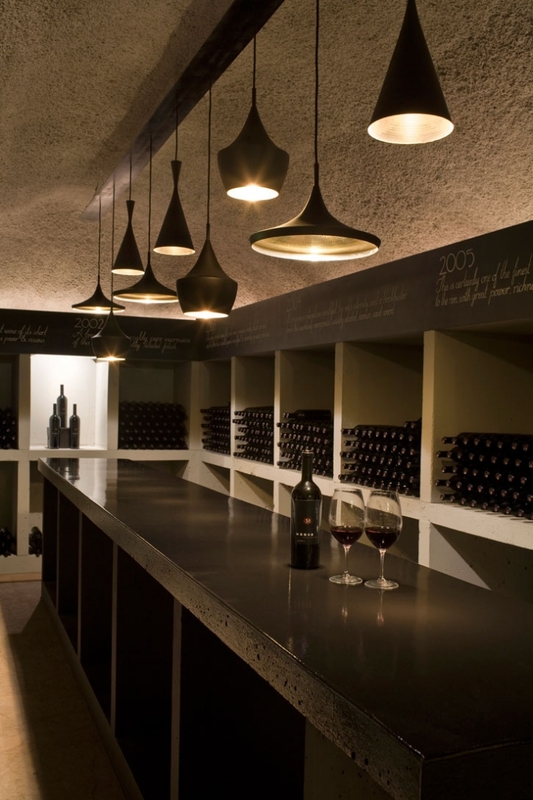 The Cave Tasting Table is the smaller tasting area in the cave which has been created right outside the Merus winery main building. 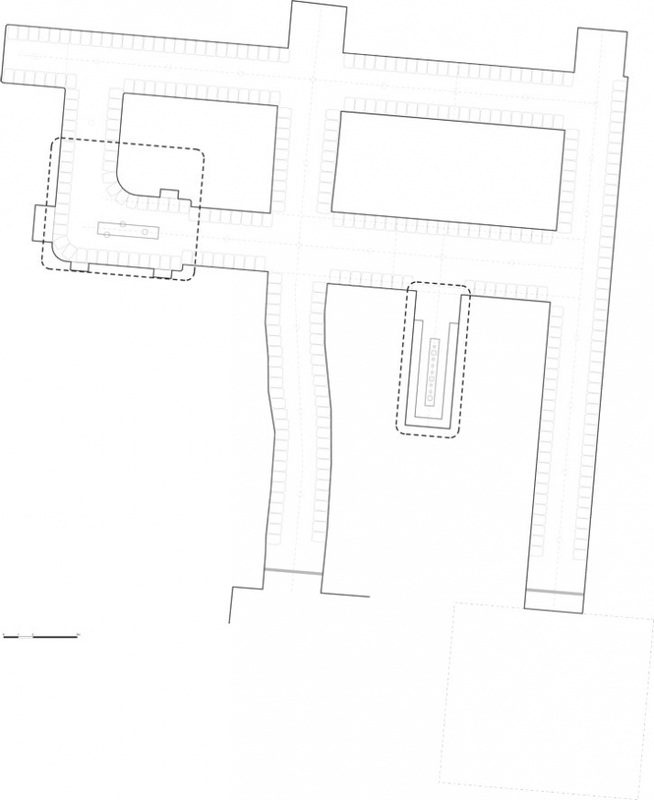 The stone façade of the cave has a large wooden door which leads to The Cave Testing Table and The Cave Event Space. 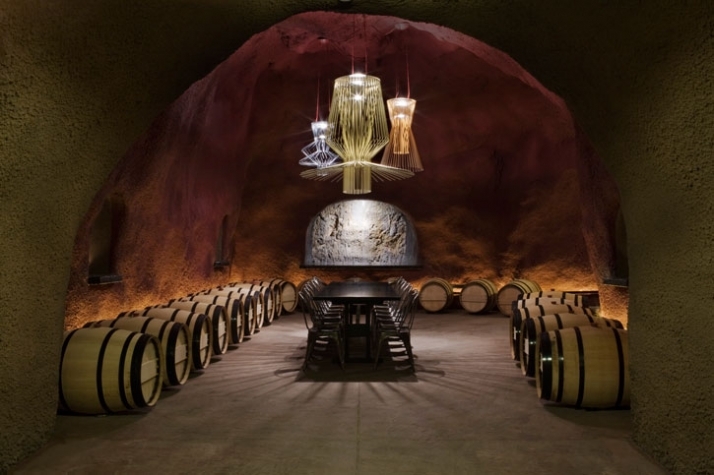 The smaller tasting area in the cave was redesigned by UXUS to reflect the sophisticated and eclectic style of the main tasting room. 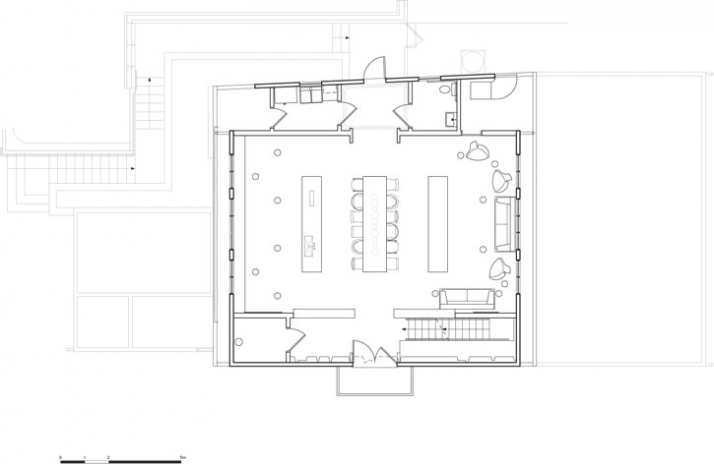 The Cave Tasting Table is in a parallelogram shaped space where literally everything has been designed to compliment this long parallelogram room. Square boxes were made to store the wines; a blackboard runs along the perimeter of the box-spaces to indicate what vintage is being sampled. The recessed cave-like ceiling and the hidden lighting creates a vintage feeling, while Tom Dixon's "Beat" hanging lamps add drama and distinctive lighting to the underground space. The Cave Events Space, which is located at the end of one of the cave’s main tunnels, is a large breath taking reception area for public events. 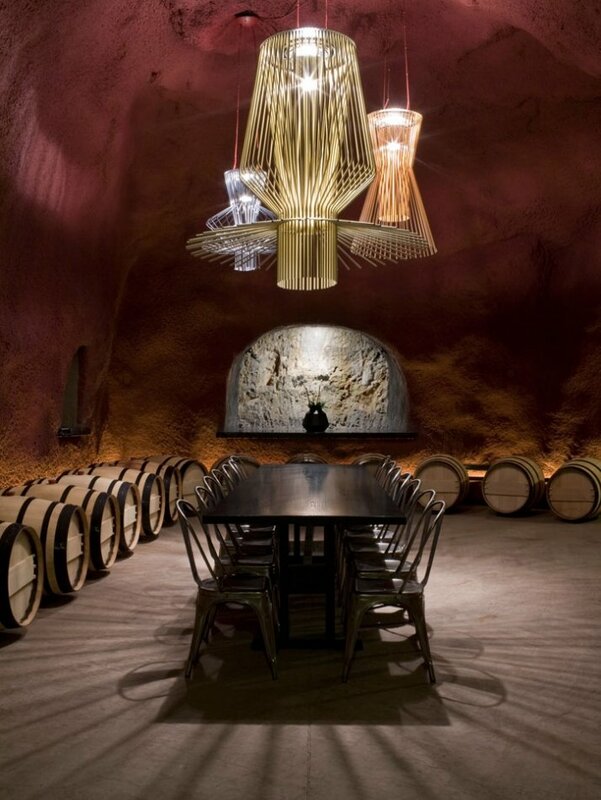 The walls of the cave are painted Merus red and dramatically set off by sparkling Foscarini chandeliers (model: Allegro). A large custom black table with turned legs is the centerpiece of the room. The large black table legs can be rolled in and out, depending on the event. 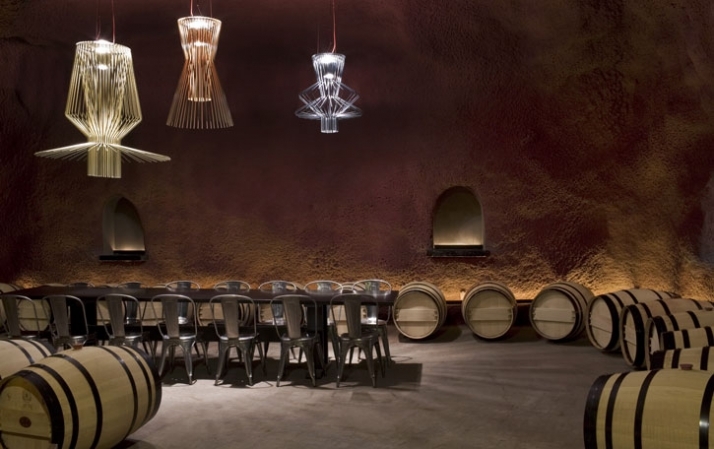 The space is a mysterious and thrilling blend of contemporary furnishings, contrasted with the rustic drama of the underground cellars, creating a one-of-a-kind wine tasting experience for visitors and customers. Finishing off with The Cave Events Space is truly something magnificent for the visitor as it is an area which through its design has managed to express a feeling of quality and opulence. It is the impression which any winery would like to leave off to its visitors. 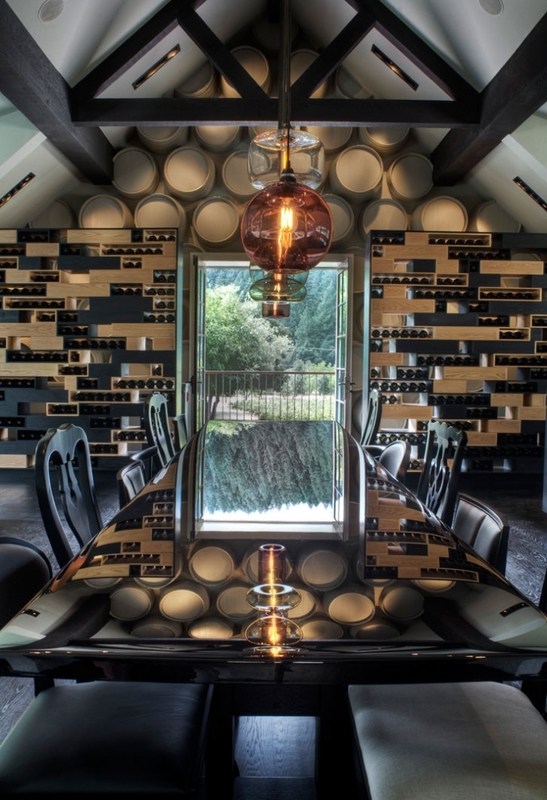 UXUS Design’s objective was to create a Winery that embodied all the Merus brand values of undiluted quality: quality, sophistication and complexity. The winery’s interior concept is refined tradition with modern sophistication, monotone classic furnishings with a contemporary twist. Sometimes monotone classic design is not bad nor is it outdated as interior design has to do with the product and the end-customer. 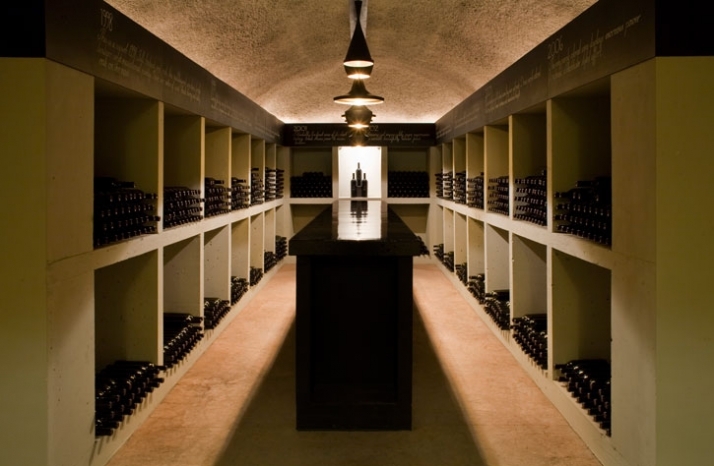 The mixed styles of the winery and the periods merge to create an stimulating and remarkable atmosphere. 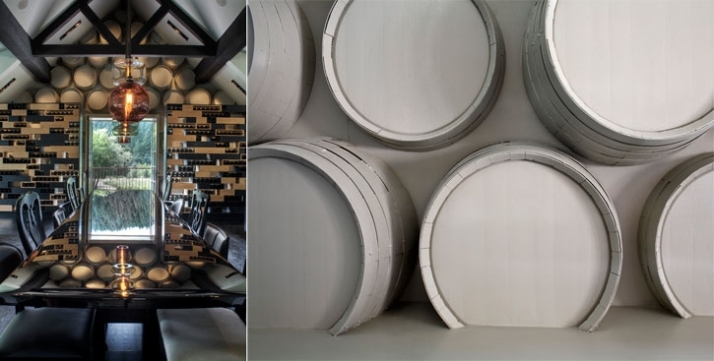 Real objects, such as wine barrels and wine crates, create surprising compositions that exude “information” about their past use, giving a sense of history and “soul” to the spaces. 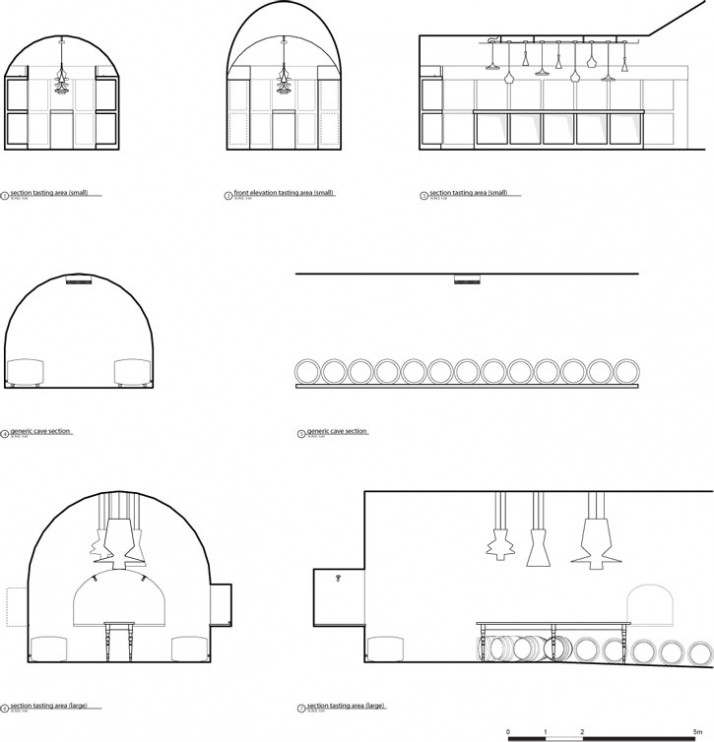 Founded in Amsterdam in 2003, UXUS design is an independent award wining design consultancy specializing in strategic design solutions for Retail, Communication, Hospitality, Architecture and Interiors. UXUS creates “Brand Poetry”, fusing together art and design, and creating new brand experiences for its clients worldwide. We define “Brand Poetry” as an artistic solution for commercial needs. Artistic solutions target emotions; emotions connect people in a meaningful way. Design gives function, art gives meaning, poetry expresses the essence.